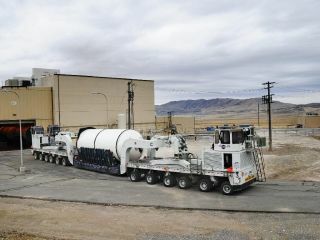 The forward segment of the qualification motor for NASA'S Space Launch System rocket is transported through manufacturing and assembly at ATK's facility in Promontory, Utah in preparation for a full-scale ground test there in the spring of 2013. Newly efficient assembly methods should lower the price tag of NASA's giant new rocket for deep space missions, agency officials say. Engineers at ATK Space Systems in Utah are putting together the solid rocket boosters for NASA's Space Launch System (SLS) heavy-lifter, which is designed to blast astronauts toward near-Earth asteroids, Mars and other destinations beyond Earth orbit. The new boosters are similar to the ones that helped loft NASA's now-retired space shuttles to orbit. But several new upgrades and improvements should allow the new boosters to be built more cheaply and efficiently, officials said. For example, ATK replaced traditional X-ray inspections with an ultrasonic examination of the booster's nozzle, allowing technicians to evaluate the hardware on the production floor, officials said. And the company reduced the number of moves during one stage of booster assembly from 47 to seven, decreasing both the time required to complete the process and the chance of damage to parts in transit. In all, new handling methodologies can reduce the booster's total assembly time by 46 percent, ATK engineers estimate. "As we were challenged with decreased budgets and a more streamlined workforce, we knew we had to make changes in order to stay competitive, but we also know the importance of ensuring we deliver a safe and reliable product for America’s human space flight program," said former astronaut Charlie Precourt, general manager and vice president of ATK’s Space Launch Division, in a statement. The improvements have been implemented throughout the manufacturing of Qualification Motor-1, the next full-scale test article for the SLS booster, NASA officials said. Engineers are preparing the motor for a ground test in the spring of 2013. The SLS first stage will be powered by four RS-25 engines — which served as the main engines for the space shuttle fleet — flanked by two five-segment solid rocket boosters. This artist's concept shows NASA's Space Launch System atop its Florida launch pad. In its initial configuration, the SLS will be capable of launching 70 metric tons of payload and will generate 10 percent more thrust than NASA's Saturn 5 rocket, which blasted Apollo astronauts toward the moon. It will stand about 320 feet tall (97.5 meters). However, NASA wants to scale SLS up eventually, creating variants that can loft 105 and 130 metric tons, respectively. That booster version would stand 400 feet tall (122 m), making the world's largest and most powerful rocket. Manned missions to Mars will require the 130-ton version, NASA officials have said. SLS is designed to launch NASA's Orion crew capsule. The first test flight of the huge rocket is slated for 2017, and NASA wants the SLS-Orion combo to be launching astronauts by 2021. The agency is targeting a $500 million per-launch cost for SLS once it's flying regularly, though things could change as the rocket program matures.